We normally organize pickup from LJUBLJANA (Brnik) airport in Slovenia or TRIESTE (Ronchi/Monfalcone) airport in Italy. This transport is included in price. Other than that, easily reached airports in vicinity include: PULA, RIJEKA and ZAGREB in Croatia; VENEZIA (Marco Polo or Treviso) in Italy or KLAGENFURT in Austria.We can arrange a pickup there too for a small surcharge. Other options can also be discussed. At the moment, out of budget airlines, WIZZ AIR and EASYJET fly to Ljubljana from London or Brussels. 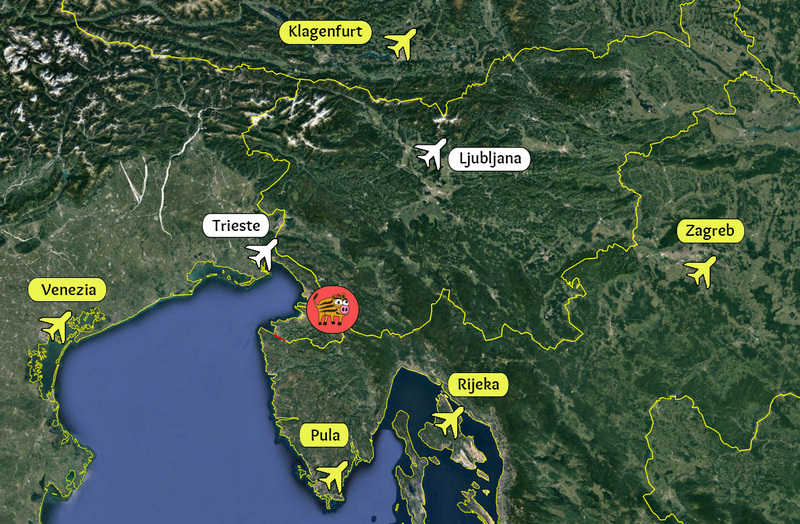 Trieste is RYANAIR hub, with flights to Valencia and London. Meanwhile, you can get to Venezia (Venice) from all over Europe. Less budget options are plentiful. Maybe you can check out national airline, ADRIA. Air France and Turkish airlines may have some cheap options too. Please be aware that we start our normal itineraries on Saturday. That's the day you should fly in. For 9-day itinerary you fly out on Sunday. The weekend option ends on Sunday. The time you fly in depends on you. Take that into the account when checking flights and consult our Dates & Prices page. It is possible to arrange different dates and schedules but it is subject to availability and extra fees. Please enquire about it here. There is no need to search for flights in incognito mode or change computers to get cheaper airline price - it's just a myth. The best advice we can give you is that, after getting confirmation that the holidays are happening, you book early, try to search and maybe wait a bit for a good price and then just book it! © 2017 Rocktrotters Climbing Holidays. All Rights Reserved.